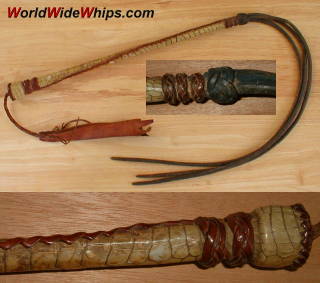 Despite its outer appearance, this whip is in fact a sjambok. It is made from a single rod of hippo hide, split into three about half the length. So, the three tails are not bound to the handle but are part of it, with the turk´s head being just decorational. The handle was finished with Snakeskin and some goatskin applications. Vintage item, no souvenir. Too large for being a riding whip, this might have belonged to a slave trader (not sure).